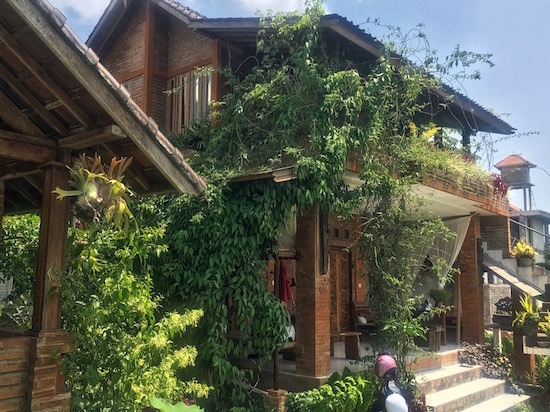 We first spotted the guesthouse when we stopped for a juice at Bata Bata Warung — it was the largest sized fruit juice we’ve seen, served with a stick of crunchy fresh sugarcane. For 25,000 rupiah it alone is worth the stop. A lotus pond borders the path behind the warung, with stepping stones through the pond leading to the bungalows. At each entrance is an open, local-style kitchen. 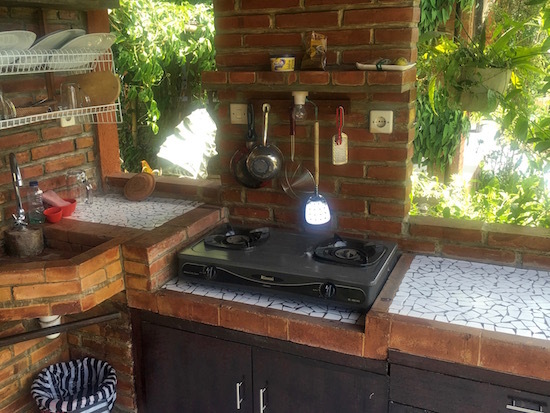 Utensils hang above the gas cooktop and plates are stacked above the sink. The effect is rustic and decorative rather than just utilitarian. A rough wood-slab table and bench make an outdoor dining room. The doors to the guesthouse are assembled from a patchwork of wooden offcuts. Inside, built-in shelves and storage areas are built with the same recycled elements. The larger double-storey bungalow comes with a double and two single beds. White sheets and red blankets add pops of colour to the otherwise brown brick and wood interior. A small fridge is built into one corner and another bespoke wooden table and bench provide seating. Drinking water refills are available from a cooler that is curiously placed between the beds — handy if you get thirsty during the night. The ceiling is exposed terracotta roof tiles adding to its rustic charm, but perhaps resulting in it being a little warm inside. Only a small box fan is provided, which may not be sufficient on a hot night. Light brightens the room through multiple tall thin windows. The whimsy continues into the semi-open hot-water bathroom. A round crazy-mosaic-tiled disc juts out from the corner of the bathtub creating a handy bench. There are plenty of built-in shelves and hanging racks too. A separate shower is ringed by plants and moss (or perhaps mould) in the open air part of the room. This could in time become grungy, but at present gives more of a natural impression. 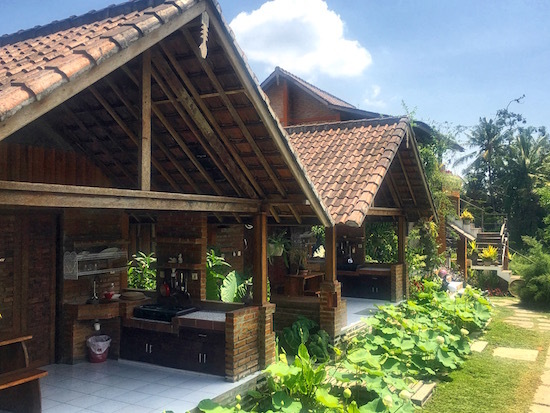 Outside, a small vegetable garden that provides for the warung is at one end of the property. 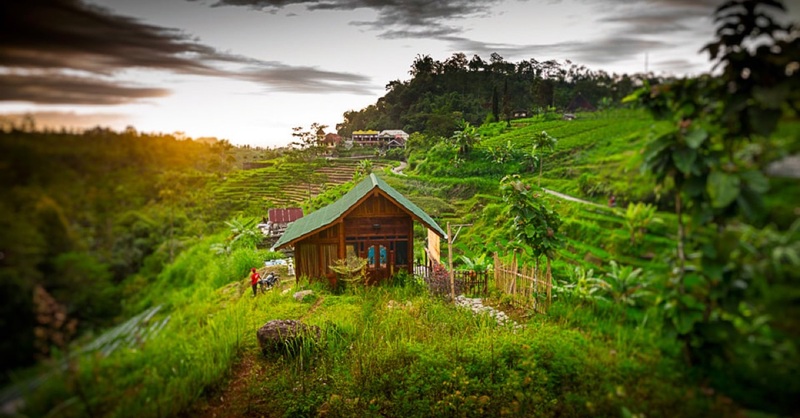 Rice paddies, coconut palms, and ducks going about their business complete the rural scene. 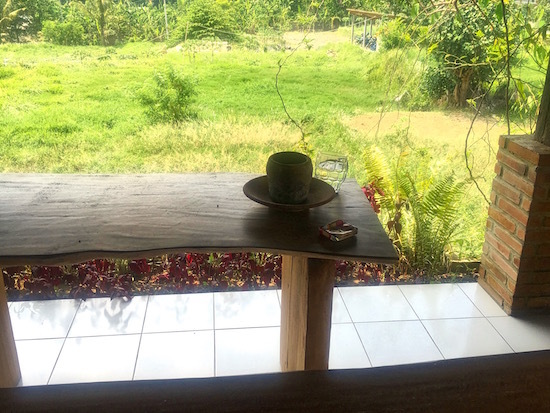 Free WiFi is available in the warung, but doesn’t quite reach the bungalows. We felt that Bata Bata was slightly overpriced, considering they don’t have a pool, air-con or even ceiling fans and the rate doesn’t include breakfast. 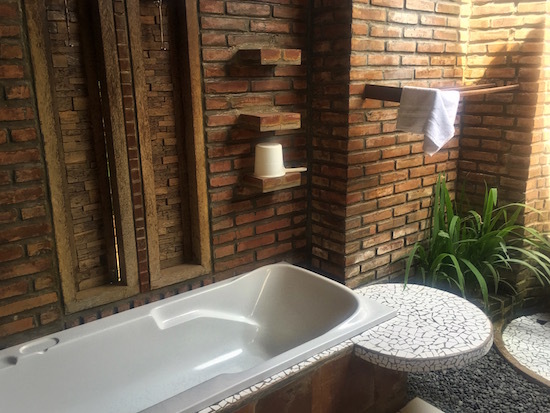 But that’s the compromise in Ubud for something a little more hipster than a cement box. 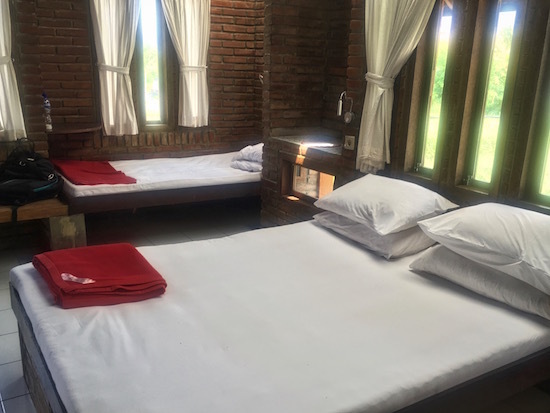 This cosy guesthouse may not be to everyone’s taste, but Bata Bata is certainly an original. To dine in or not to dine in. Bata Bata is at the very end of Jalan Bisma, before it turns into the walking track to Monkey Forest Road.